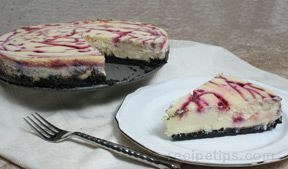 Rich and creamy, this White Chocolate Raspberry Tart is the ultimate in comfort food: fresh raspberries with a sweet white chocolate sauce in a flavorful pecan crust. In a large mixing bowl combine the pecans, 9 tbsp. of butter, sugar, flour, orange zest, and beaten egg; blend thoroughly using an electric mixer. Press the crust mixture into the bottom and on the sides of an 11-inch tart pan or into 6 4-inch miniature tart pans. Place the crust lined tart pans into the freezer for 15 minutes before filling. After they have been in the freezer for 15 minutes, remove them and place in an oven preheated to 375 degrees F. Bake for 20 minutes or until top edge of crust is golden brown. When done, place them on a cooling rack and allow to cool completely before removing them from the pans. While tart shells are cooling, start to prepare the filling. Go thru the raspberries and clean them. Remove any blemished berries. Set aside until shells are cooled. Chop the white chocolate up into small pieces and place in a heatproof bowl. Bring some water to a simmer in a pan large enough to hold the bowl. Once the water is simmering, place the bowl in the water and turn the burner off. Allow it to set in the water until melted; stir every 5 minutes until it is all melted. Once the white chocolate is melted, add the cream and 3 tablespoons of butter. 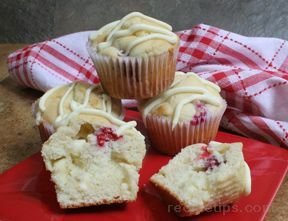 Whisk together until mixture is smooth and creamy. Place the raspberries in the bottom of the tart's shell and then pour the white chocolate mixture over the raspberries until the shell is filled to the top. Place the tarts into the refrigerator and allow to cool for at least 3 hours before serving. To make up the whipped cream, pour 1/2 cup of heavy cream into a bowl and beat on low until bubbly and then turn up to medium speed and mix until trails are visible in the whipped cream. Then add the powdered sugar and vanilla and beat on high until stiff peaks form. 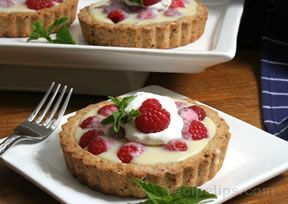 Garnish the tart with whipped cream, raspberries, and mint if desired.